The largest island with 8,335 km² Greece (Greek: Kriti) in the length of 260 and the width of 60 kilometers lies before the south exit of the Aegean Sea, From west to east Crete is crossed by a mountain range with up to 3000 meters altitude. Between the mountains there are fertile valleys. It was in ancient times the center of the Cretan-Mycenaean culture, came 67 v. Chr. In Roman possession and was then under Eastern Roman, Arab, Venetian and Ottoman rule. 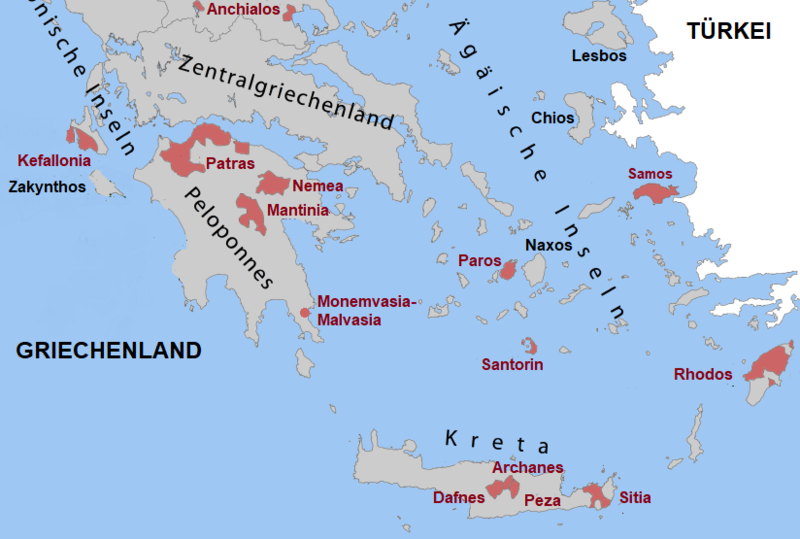 Only in 1913 did the island come to Greece. It is believed that the first cultivated vineyards of the Mediterranean area were located in Crete, but it is certainly one of the oldest wine-growing cultures. Near the municipality Archanes During excavations in Vathipetro a wine press was discovered, which dates back to 2000 BC. Chr. In the Middle Ages, the island of Candia was known for its sweet wines Malvasia and muscatel were about the port city Monemvasia ( Peloponnese ) shipped to the whole of Europe. For a long time, Crete was considered to be the pure producer of over 400 hl / ha with extremely high yields mass wines through big ones Winzergenossenschaften, From the 1990s on, a rethinking gradually took place. There are four as POP (before OPAP and OPE) classified appellations, these are Archanes (Red wine), Dafnes (Red wine), Peza (Red wine and white wine) and Sitia (Red wine and white wine). Well-known producers are Alexakis, Boutari, Creta Olympias Winery, Digenakis, Douloufakis, Ekonomou, Lyrarakis, Minos Cretan Wines and Mrdakis. This page was last modified at 14 February 2018 at 13:55.